Background: Xuesaitong mainly comprises Panax notoginseng saponins and has shown a promising feature in an acute ischemic stroke model; however, its effect on long-term recovery following stroke, and the related mechanisms, are unknown. Methods: The objective of this study was to investigate the long-term protective effects of xuesaitong against ischemic stroke and its effect on microglial polarization. Experimental cerebral ischemia was induced by middle cerebral artery occlusion (MCAO) for 45 min, and C57BL/6 mice were immediately injected with xuesaitong or vehicle through the caudal vein at the onset of cerebral reperfusion consecutively for 14 days. The animals were randomly divided into three groups: a sham-operated group, vehicle-treated group and xuesaitong-treated group at a dose of 15μg/g. Subsequently, 2,3,5-triphenyltetrazolium chloride staining was used to assess infarct volume, and adhesive removal tests and balance beam tests were used to evaluate neurological deficits at days 1, 3, 7 and 14 following ischemia. Reverse-transcriptase polymerase chain reaction and immunofluorescence staining for M1 markers (CD16, iNOS) and M2 markers (CD206, arginase-1) were performed to characterize phenotypic changes in microglia. Elisa was used to determine the release of pro-inflammatory and anti-inflammatory cytokines. TUNEL staining was conducted to detect neuronal cell apoptosis, and western blots were used to determine the activation of signal transducer and activator of transcription 3 (STAT3). Results: Our results revealed that xuesaitong treatment, compared with vehicle treatment, significantly reduced cerebral infarct volume 1 and 3 days after MCAO and resulted in significant improvements in long-term neurological outcomes. Furthermore, xuesaitong treatment, compared with vehicle treatment, significantly reduced M1 markers and elevated M2 markers 7 and 14 days after MCAO at both the mRNA and protein level in ipsilateral brain tissue. This finding was also accompanied by a reduction in neuronal cell apoptosis and p-STAT3 transcription factor levels in the xuesaitong-treated group compared with the vehicle-treated group. 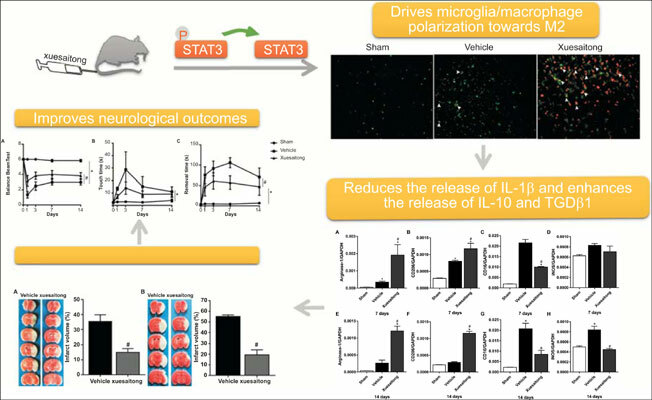 Conclusion: We demonstrated that xuesaitong has long-term neuroprotective effects against ischemic stroke, possibly by promoting the polarization of microglia to an M2 phenotype and by inhibiting neuronal cell death via down-regulation of the STAT3 signaling pathway, providing new evidence that xuesaitong might be a promising therapeutic strategy for ischemic stroke. Xuesaitong, microglia, polarization, cerebral ischemia, STAT3, phenotype.